Brett Weiss: Words of Wonder: Old School Gamer Magazine #9 Now Available -- READ FOR FREE! Old School Gamer Magazine #9 Now Available -- READ FOR FREE! Old School Gamer Magazine #9 is now available! You can read the digital version for FREE by clicking HERE. 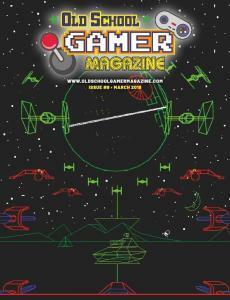 If you'd like to subscribe to the print version of Old School Gamer, click HERE. The colorful, info-packed, labor-of-love publication features articles by yours truly, Q*bert creator Warren Davis, historians Leonard Herman and Michael Thomasson, The Minds Behind the Games author Patrick Hickey, and others, including an interview with legendary Atari 2600 programmer Dan Kitchen.